Winter is the time to retreat—to go back into cozy quilts and enjoy a cup of coffee while it snows. However, it may not be that easy for your dog, whether or not it loves winter. You must take certain steps to ensure that your dog is able to spend away its winter without problems. If you have a dog with a thick fur, then you do not need to worry too much as it is naturally conditioned to protect itself from winter. However, in case your pet dog has thin fur coats, then you will have to arrange for a coat or sweater for it. A typical coat should extend from the neck to the end of the tail and must provide coverage around the belly region. 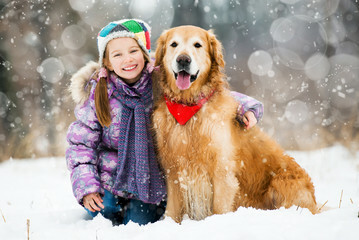 However, keep in mind that these outwears will not protect your dog from frostbite so make sure you do walk your dog outside for too long. In continuation of the first tip, you should consider limiting the time your dog is allowed to roam outside. Even when it is not snowing, you should restrict your dog’s outdoor timings. Take your dog outside for some exercise and return as soon as the temperature drops. In case your dog is alone outside in the yard, keep a check and note if there are any signs of acold. Giving your dog sweaters will not suffice unless they have a warm place to rest. Do not let your best friend sleep on the cold floor; instead, arrange for a cozy bedding and provide it with warm blankets to cover its body. It is advisable that you place your dog’s bedding close to a warm area in the house. You will be using heaters, and the heat from them will attract your dog friend—you need to be careful about this. Place the heaters in places which your dog cannot reach. In case you have a fireplace, install a pet-proof system to protect your furry friend from harm. It is highly recommended that you get installed baseboard radiators to minimize chances of any harm coming in your friend’s way. Dehydration is a common problem in winters—your dog is as vulnerable as you are. If your buddy spends a lot of time outdoors, you should replenish its body by giving it plenty of water. Do not let your dog get dehydrated which otherwise would bring a lot of troubles. If you did not know already, dogs suffer from cracked pads, and hence, you will need to take extra precautions to protect the pads. Whenever you come indoors after a walk, make sure you wipe your dog’s paws to get rid of any winter salt which is found on sidewalks—do not let your dog lick it off.